Children of all ages LOVE play dough. What is so great about it? There is something very soothing and therapeutic about working with play dough for a child. It helps them understand size, weight and volume in a concrete, hands on way. It also builds vocabulary: big, little, long, short, lumpy, heavy, light more, less and every shade of colour. It is great for motor skills, working with big chunks or tiny pearls of dough. It develops imagination, as the child can create whatever s/he wants. Enough dough – the recipe will guide as to how much to make! 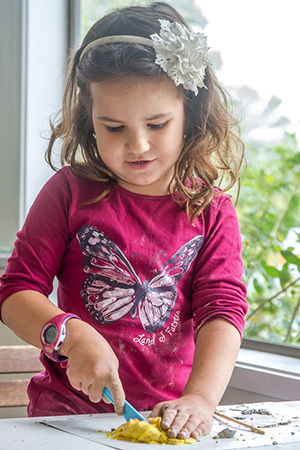 To get the best out of this activity, let your child help make the dough – lots of measuring and everyday maths. You can try out different recipes together too, and talk about how everything combines to make play dough (basic chemistry). Secondly, have everything ready to go – play dough, cutters, aprons or t-shirts. That way the children can get on with the work of playing freely. Finally, show lots of interest in what they are creating - talk about the play, play with them, and suggest ideas to extend the play. Hours of happy learning!